Favorite food/dish or recipe: I love cooking, it’s my greatest passion, but I would have to go with Cacio e Pepe. Noodles loaded with black pepper, Parmigiano, and Pecorino Locatelli. Again, simple but delicious. Favorite movie/book/or band: Movie: Extremely loud and incredibly close, I saw it for the first time in the theatre with my parents. I was so moved by the film and I can’t help but get emotional every single time. But Really. Anything with Tom Hanks is on top of the list. 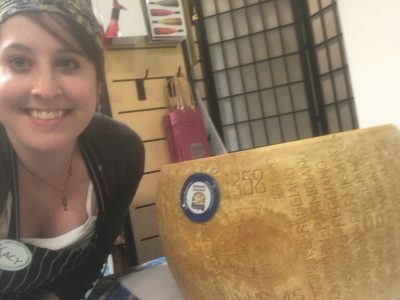 What do you like best about working at the cheese Lady? The team. I’ve never worked with such a great group of people. Honestly the best group of smart, strong women I could ask for. Also, the customers –whether a “regular” who stops in week after week, or a “first timer”, the customers really make the shop what it is today. There’s a lot of mutual respect, which isn’t found everywhere. Personal Tidbit of interest about you? I recently bought my first home, which is very exciting! I can’t wait to do my first major project and see my home become more “me” through the years. Also, I have the most amazing 9 year old Chihuahua named Pip. He is the Love of my Life.